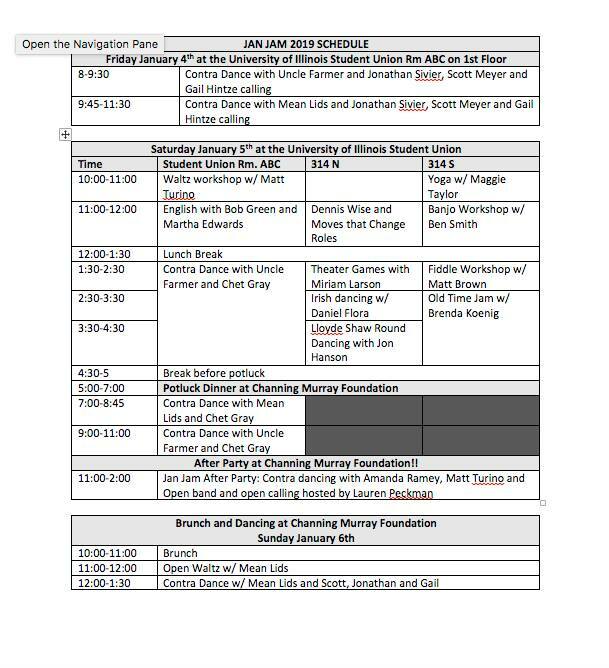 Most of the weekend's events will be held at the Illini Student Union, 1401 W. Green in Urbana, Illinois. The weekend will also feature several workshops and other fun activities. All events held at the Illini Union unless noted otherwise. 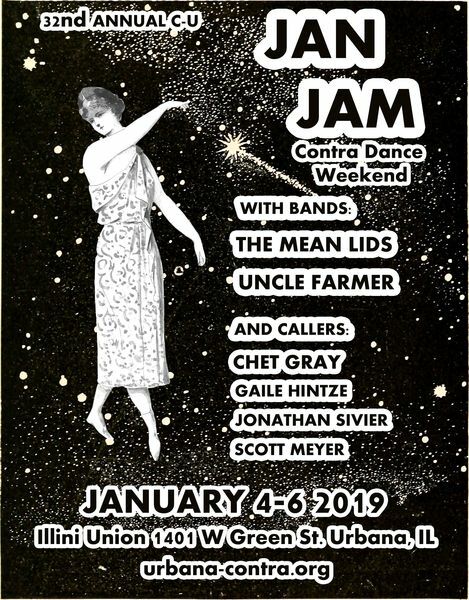 The Friday and Saturday contra dances will be held in the Illini Rooms on the first floor of the Union. Workshops galore starting at 10 a.m.! There will be an assortment of workshops taking place in multiple rooms. Check back later for a list of workshops. This year we are offering online payment for Jan Jam admission. If you wish to pay online please fill out this Online Registration Form. You can then make your payment at our Online Payment Site. Online payment includes a small service fee. * - Students or 18-25. 12 and under free. If you are unable to attend due to weather or other reason let us know before the event and your check will be returned. If you made your payment online we will send you a refund check in the mail. The closest place to stay is at the Illini Union Hotel, in the Illini Student Union where the dance is being held. We have a block of rooms available at the Illini Union for $85. Call them at 217-333-1241. Check in is 3 p.m.; check out is noon. Or look at the Hotels & Lodging section of the Visit Champaign County page for plenty of other options. For housing with local dancers, please contact Mark Jaeger at 217-344-1739 ASAP since space is limited (deadline Dec 19).